I will explain how to configure the architecture of the HANA Database. When constructing the HANA DB, I will explain the representative methods in various ways with the pictures. I will explain S / 4 HANA and HANA DB 2.0 more specifically. You will be wondering how to configure HANA DB 2.0, the database that makes up S / 4 HANA. You need to build S / 4 HANA for your investment and your company’s situation. You need to consider high availability and think about disaster recovery. Let’s take a look at the various options to build the S / 4 HANA most effectively considering the cost of investing in the company. To build HANA DB 2.0, there are 7 kinds. Of course, if you go into detail here, you get more choices and can distinguish more than seven. In this section, I will explain seven things. The HANA Classical Architecture is the most common and has a lot of structure in general companies to date. One server, one database, one DB Schema, and one S / 4 HANA Application. It is the simplest, easiest and easiest structure to construct. Since one S / 4 HANA application uses all H / W resources (CPU, Memory) on its own, CPU and Memory can be used by one application at maximum. It is a structure that can use H / W resources without interference of other applications. H / W cost is high for independent H / W configuration. 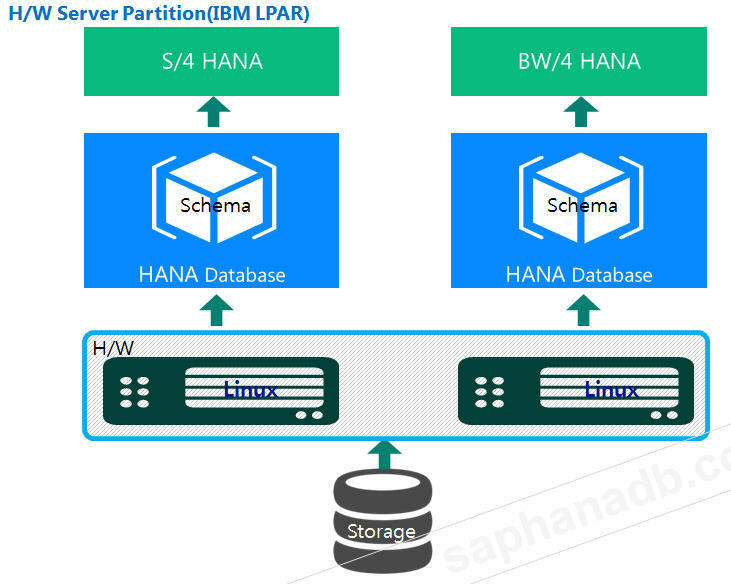 The HANA H / W Server Partition is most commonly applied to IBM LPARs. It is a structure that uses memory alone and not shared. H / W box is used together, but CPU and Memory are not shared. 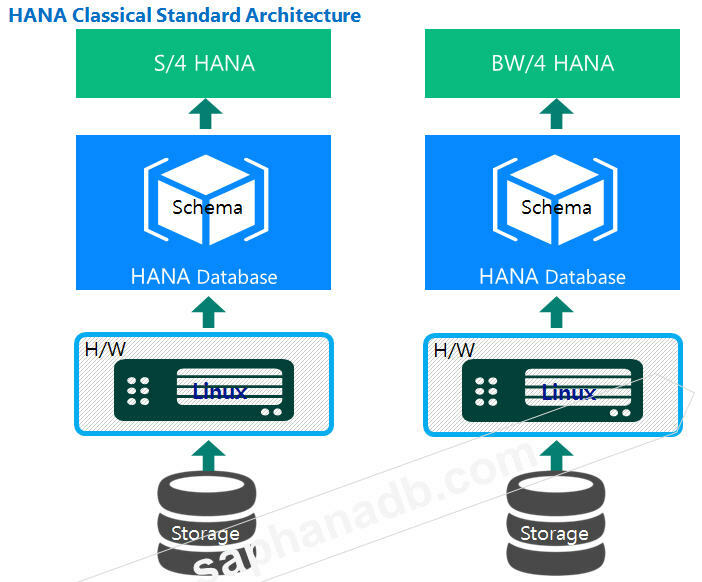 The advantage of this configuration is the same configuration as Classical configuration, which can reduce the physical space, and one S / 4 HANA application is a common configuration using CPU, Memory alone. However, the difference is that we use a hybrid H / W BOX together. 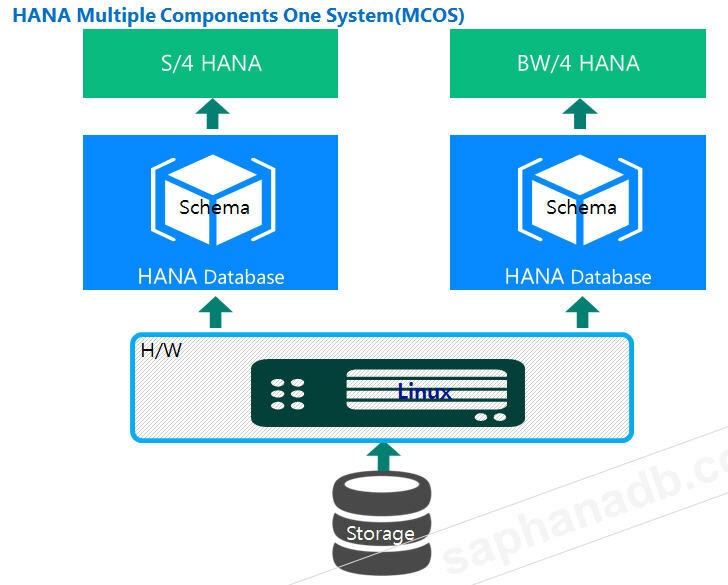 HANA Multiple Components One System (MCOS). 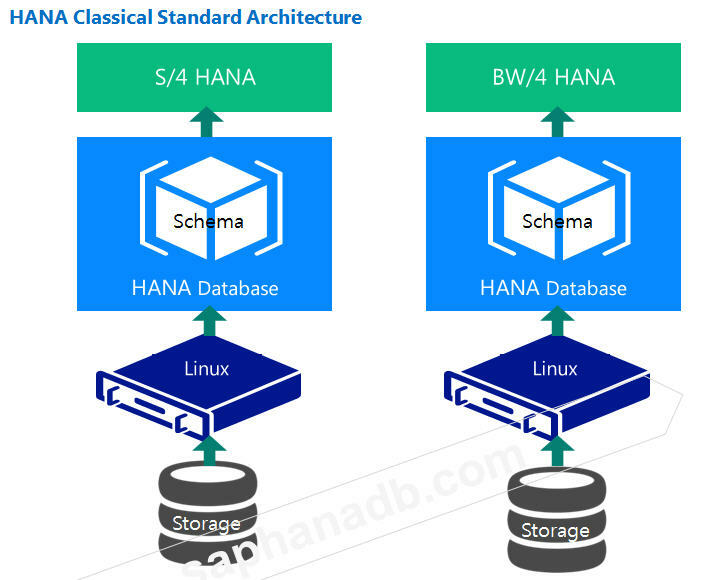 It is composed of one HANA DB in one H / W, several DB Schema, several S / 4 HANA, BW / 4 HANA and so on. The primary reason for this configuration is to reduce costs. In order to minimize the cost and maximize the effect, the configuration differs from the following Multi-Tenant Database Containers (MDC) and Multiple Components One Database (MCOD). This configuration is not recommended for production environments because it uses one H / W CPU and memory. Performance is deteriorated because it is shared with several applications (S / 4 HANA, S / 4 BW, etc.) and CPU and Memory. 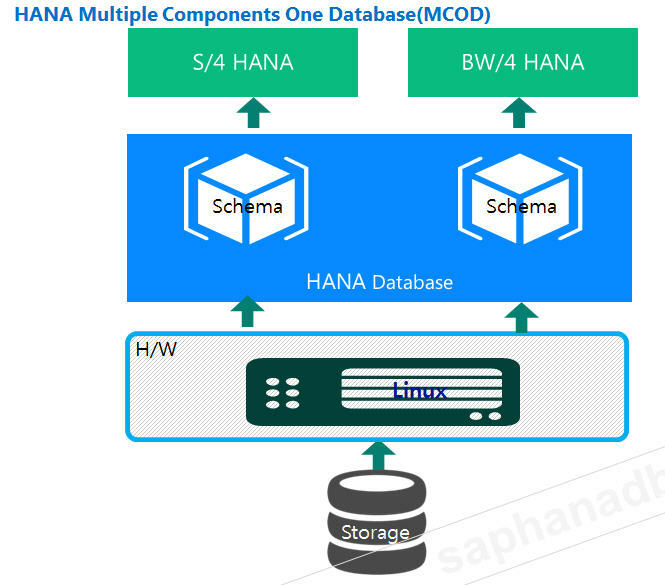 The HANA Multiple Components One Database (MCOD) uses one HANA DB, two DB schemas and two S / 4 HANA applications in one H / W. MCOD is the term used before HANA 2.0 Tenant DB came out and is very similar to Tenant Database Containers (MDC). It’s a similar concept, with different concepts coming out. The difference is that HANA DB is used together. CPU / Memory, which is the same hardware resource, may be shared, which may result in performance degradation. The main reason to configure MCOD is cost savings. Since one HANA DB is used for one H / W, the labor required for cost and management is reduced. HANA DB is shared and used, but management cost is reduced. When HANA DB is shut down, both applications are stopped. CPU and memory resources can be shared, which causes performance degradation, and HANA DB shutdown causes other applications to stop. 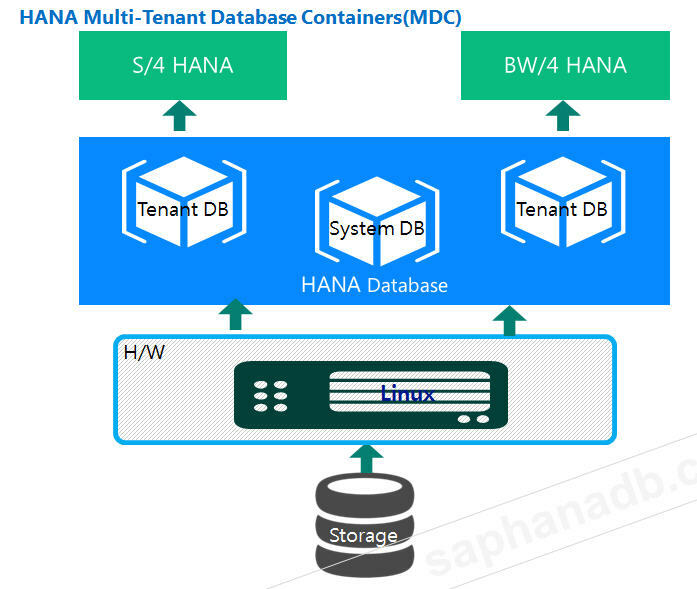 MDC (Tenant Database Containers) consists of one HANA DB in one H / W, several DB Schema and several S / 4 HANA applications. HANA Multi-Tenant Database Containers (MDC) is a Tenant DB for HANA DB released from HANA 2.0 SPS01. HANA 1.0 and HANA 2.0 SPS00 are default Single Container System. 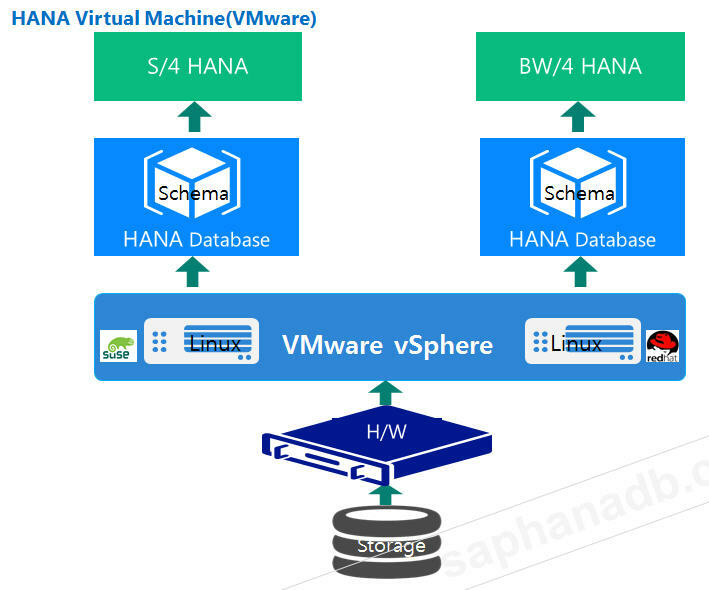 HANA Virtual Machine (VMware) is a virtualization solution that consists of installing multiple Operating Systems (OS) on one H/W to form an S/4 HANA application. HANA 1.0 SPS05 is now the first VMware Hypervisor support. Two OS(Operating System) are installed in one H/W, two DB schemes in two HANA DBs and two S / 4 HANA applications. The main reason for this configuration is the reduction in cost and the area to manage. Virtualization is going on in Windows server, HANA DB is installed in LUX, and SAP HANA DB can be installed and configured in virtualization (VMware). In general, the company has been considering how to reduce dozens or hundreds of servers, and the introduction of virtualization has resulted in a reduction in the number of physical H/W servers. As the H/W Box decreases, the cost will decrease and the administrative costs associated with it will also decrease, so there is nothing better for the company (see SAP Note 1788665, 2652670). 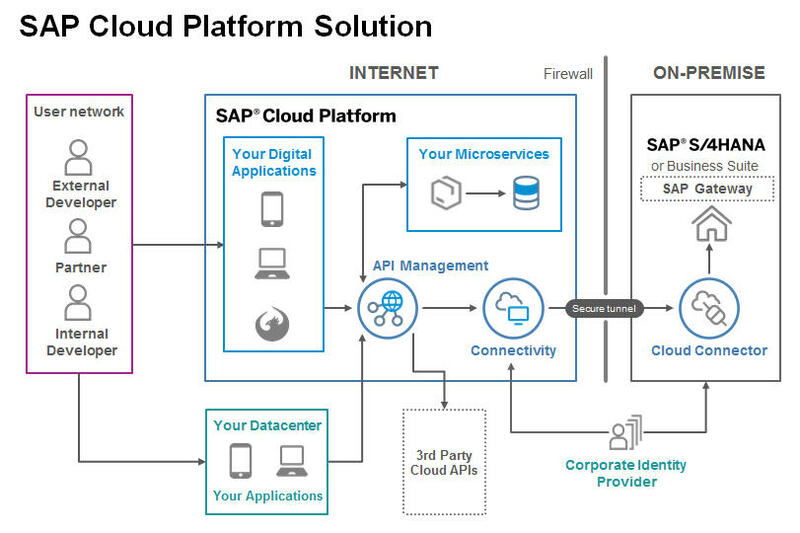 SAP’s Public Clouds include Amazon Web Services (AWS), Microsoft Azure, IBM Cloud, Google Cloud Platform, and Oracle Cloud. 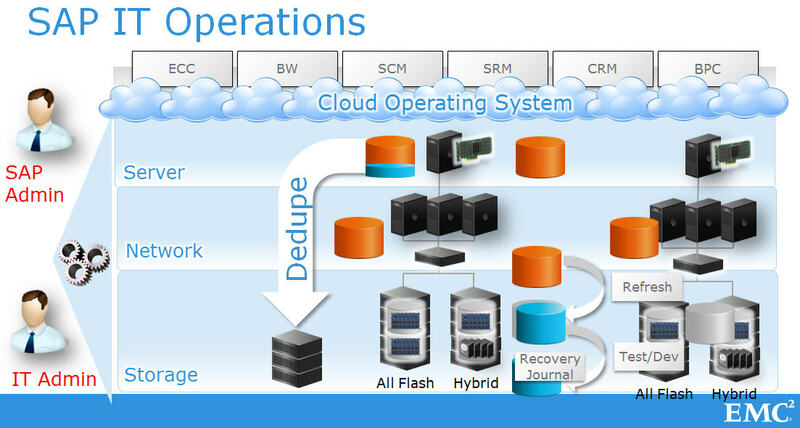 Here is a brief summary of the cloud and the cloud provided by HANA. Offered service name : Amazon EC2, S3, Microsoft Azure, Google Cloud, IBM Cloud etc. It is the most basic category of cloud computing services. With IaaS, you lease IT infrastructure from servers, VMs (virtual machines), storage, networks, and operating systems on a per-volume basis from cloud providers. PasS(Platform as a Service) : A way for developers to provide a computing platform to develop, test and run their own applications. PaaS is designed to make it easier and faster for developers to create web apps or mobile apps without having to set up or manage the basic infrastructure of servers, storage, networks, and databases required for development. Offered service is Linux, Apache, PHP, MySQL, MS Azure, Goold Apps etc. Offered service name : Naver’s Ndrive, iCloud, Dropbox, Google Docs, MS Office 365 etc. A way to provide software applications on-demand and on a regular subscription basis over the Internet. With SaaS, cloud providers host and manage software applications and underlying infrastructure, and handle maintenance such as software upgrades and security patches. Users typically connect to applications over the Internet using a web browser on a mobile phone, tablet, or PC. Example) It is common to share a car such as Uber, which is famous for shared cars, or “Tada” which is a Cacao’s carpool. Private) Cloud : Cloud computing resources that are used exclusively by a single business or organization. Private clouds can be deployed within your company’s physical onsite data center. Some companies also pay third-party service providers to host their private cloud. A private cloud is a cloud in which services and infrastructure are maintained on a private network. Example) This is the business car used by the LG washing machine division. Hybrid Cloud : Combine public and private clouds that are bound together as a technology that allows data and applications to be shared between a public cloud and a private cloud. Hybrid clouds allow you to move data and applications between private and public clouds, giving your business more flexibility, more development options, and optimizing your existing infrastructure, security and compliance. Example) If you are going to work at the washing machine business and go to work, all of your business cars are in use. If you are using carpool “Tada” in Cacao, this is the case. Source: What is Cloud Computing? 8. The public cloud provided by SAP is provided in IasS format (SAP Note 1380654). Therefore, the public cloud provided by SAP provides the physical hardware Infra environment (Server, Storage, Network). In addition, HANA 2.0 and ERP S/4 HANA should be installed and managed by the user. ← Happy New Year in 2019.